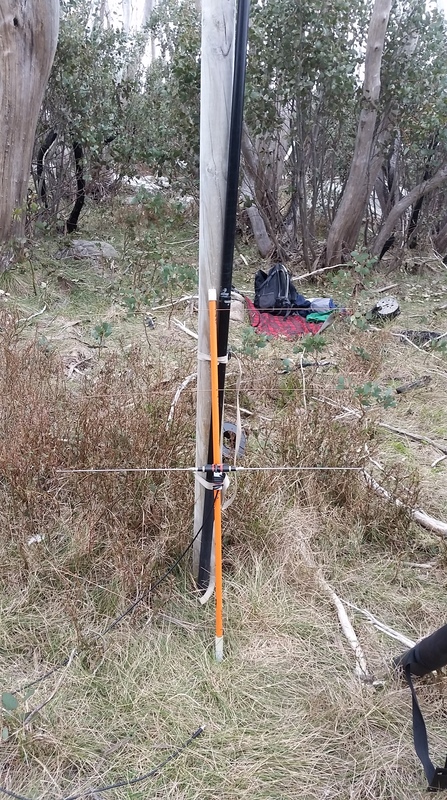 My first SOTA activation was 2 metres FM from Mt. Torbreck as this was all that I had. It was Easter 2013. It consisted of my FT470 hand held, a 5/8th ground plane using an SO239 base with 1/4 wave radials off an old diamond colinear. This slipped over a squid pole via a mount I made using perspex and some electrical conduit fittings. I also used my digitor 30 watt PA.
“First contacts were whilst approaching the cairn (inside the activation zone). They were with Ron VK3AFW near home and s2s with David VK3FMDV/p and Rik VK3KAN/p on Mt. Piper. Later with the antenna and PA set up I worked VK3s GRK, PF, XL and LO. Operational time was 32 minutes plus set up and pull down. That was about it for 2 metres other than a few contacts with other activators within simplex range; my concentration, as with most others was on HF and, with the present challenge, 6 metres. The more recent band conditions prompted a reappraisal of 2 metre operations. With my planned multi summit activation, I thought I could use the 2 metre module on my KX3 (installed last year but never used except for the initial setup) but discovered it no longer worked. Rigorous testing suggested the PA mosfet was crook. Fortunately still under warranty so a new unit was shipped out! Instead I used the VX7R and the aforementioned 5/8th ground plane that enabled some good S2S contacts with Glenn VK3YY, Peter VK3PF and David VK3IL who were all on summits within simplex range. I did not bother with the external amplifier this time. Now to my second activation of Mt. Torbreck. Due to the continued erratic propagation on HF, I thought it prudent to do something about 2 metres SSB; sort of like a SOTA insurance policy. I had thought about making just a simple dipole and an earlier idea of using TV rabbits ears came to light. Unfortunately nothing suitable was available, the units that were are now too small due to the lack of low band VHF coverage. Instead, I spied some cheap car radio antennas and thought why not use them? My criteria, and thus the “rabbit ears” was for something simple, reasonably robust yet light and being telescopic, would be compact enough to place in the pack. I purchased 2 standard lock down car radio antennas from Jaycar Electronics (Cat AR-3250) and then wondered what I could do with them? Firstly I removed all the normal mounting hardware and cut the plugs of the coaxial cable. I was not going to need any of this. By the way, the shielding on this coaxial cable is crap! Then I had a look at the telescopic section that recesses inside the vehicles guard is protected by a plastic sleeve. This sleeve screws onto the housing that normally supports the antenna and allows the coaxial cable to make contact with the telescopic whip. I removed the sleeve then extended the internal thread using a 7/16 NF2C tap (this was the best fit that I had in my kit and looks like 20 turns per inch). I did this by placing the tap vertically and pointing upwards in a bench vice then running the plastic sleeve over the tap by hand, regularly clearing out the swarf. This took a little time but reduced the risk of cracking the plastic. I ran the sleeve to the full length of the tap then removed it from the tap. Then, with a sharp stanley knife, I scored the sleeve at a length of 30mm until it was cut through. I used this short 30mm threaded sleeve to join the two separate antennas together to form a telescopic dipole. The next step was how to feed it? I decided on a simple coaxial current balun using 6 turns of cellular quality RG58 coaxial cable around a 25mm electrical conduit former. No science in this, it juts looked about right. The coaxial cable connecting to the telescopic sections was cut short and the sheathing and shielding removed. 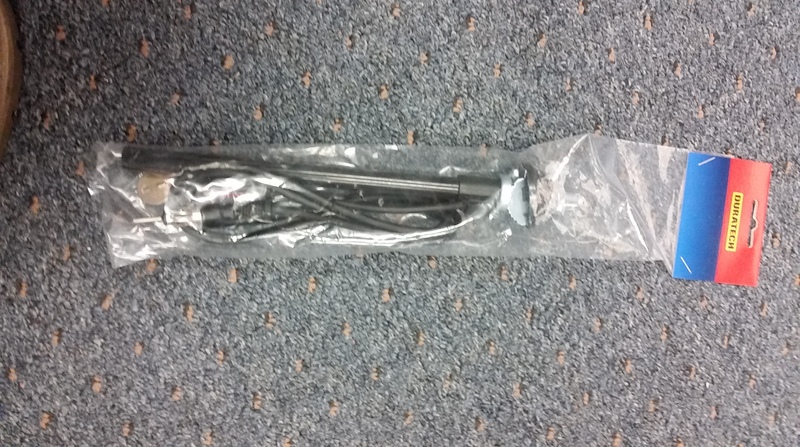 Then the RG58 was soldered directly to the short cables connecting to the telescopic whips and insulated with heat shrink. The other end of the coaxial cable to the antenna and balun was fitted with a male BNC crimp connector. So, that is the dipole! To see how it went, I connected up my VX7R, the external amplifier and SWR meter and simply adjusted the length of bot sides for a minimum SWR which was 1:1 at 144.200 mHz. BTW, to support the “now dipole” I just had it sitting in the dry branches of a convenient fruit tree. As well as making the antenna, I was chasing SOTA activators and had a chat with Bernard VK2IB/P. I told Bernard what I was up to and that I was monitoring HF in my workshop via a baby monitor in the shack. 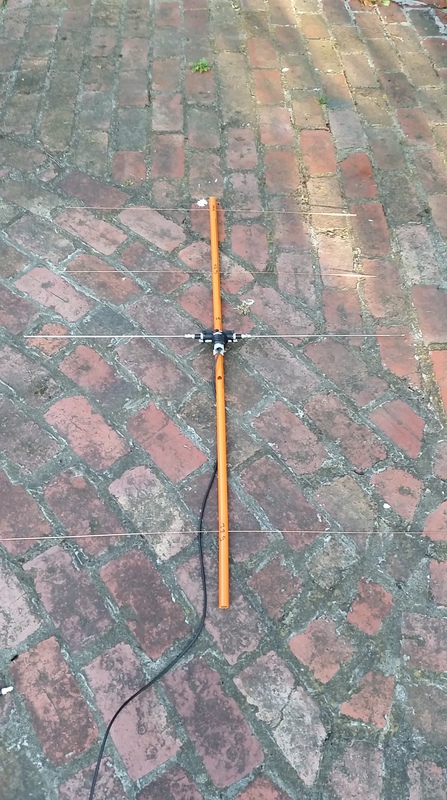 Bernard mentioned that he had a 4 element 2 metre yagi and the boom length was a bit of 20mm electrical conduit about a metre long – infact a bit longer so it could be used hand held for direction finding. So, I had a look at what I had lying around. No shortage of conduit but what of the elements. I had lots of light weight 10mm aluminium tube so I used this. However, the tube was too large for a 20mm conduit boom so i used a bit of 32mm medium duty conduit instead. 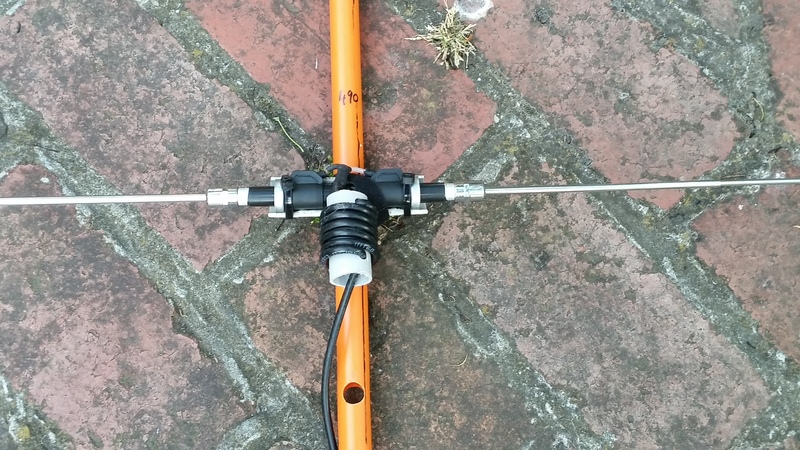 Next I drilled press fit holes for the elements, the spacing based upon some previous experimental data of many years ago when I made my first 2 metre yagi (a 7 element interlaced with a 10 metre 3 element yagi – it did work!). Following this was how to mount the driven element; I did not put much effort to this but stuck it on with duct tape. Last thing was to drill a mounting hole for the squid pole, where I tested the overall balance of the antenna and put the hole close to that location. Field testing is the ultimate test. Not surprising that the 32mm boom and 10mm elements were too big and bulky. I also needed a better method of mounting the antenna. 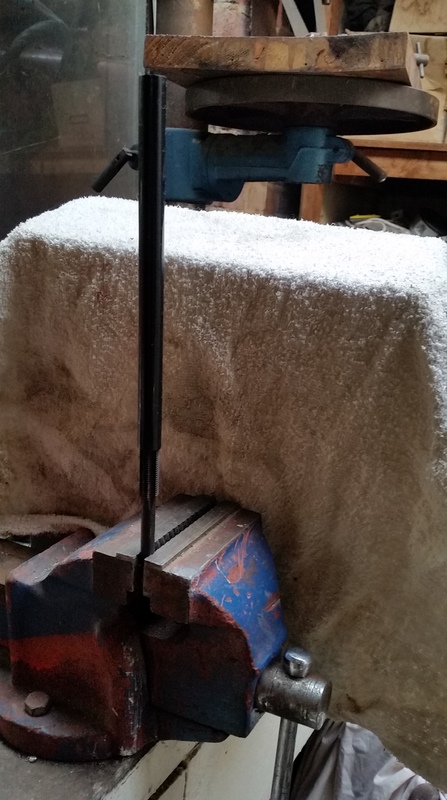 Firstly I got some 1.5mm brazing rod from the local welding supplier. They normally sell this in 5kg packets, I only wanted 3 sticks of which the kind fella behind the counter gave me 4 for nix! Thanks! to get a better SWR by playing around with the driven element location and having it closer to the first director than with the Mk1 version. It seems that the thinner elements may require a bit more effort into the design and construction for best performance. As I had lengthened the driven element somewhat for best SWR, I also increased the length of the reflector. Lastly, with my hot air gun, I made a depression in the pome so as to better locate the driven element. I did all this at night without much opportunity for further testing. This Mk2 version was used on Federation range and Mt. Gordon. It was certainly easier to transport but the mounting of the driven element was still an issue. I was also concerned with the extensions to the reflector in that being an overlap solder joint, they could be broken plus it caused imbalance and a reasonable droop in the reflector. This aside, the antenna performed well with good results similar to that of the MK1 version the previous weekend. Longer boom to enable hand held use plus to better fit the extended reflector inside during transport. Driven element mounting to the boom using an electrical conduit T split in half and modified in shape to suit with the hot air gun. The T is held to the boom using plastic pins (tappits) and a velcro cable tie. Coaxial cable of the balun secured into place with cable ties. More fine tuning of the driven element location and shortening in length and subsequent reduction in the reflector length. More strenuous testing showed the finished Mk3 version to have similar aspsects to the Mk1 and Mk2 versions but with a better front to back ratio and possibly better forward gain. 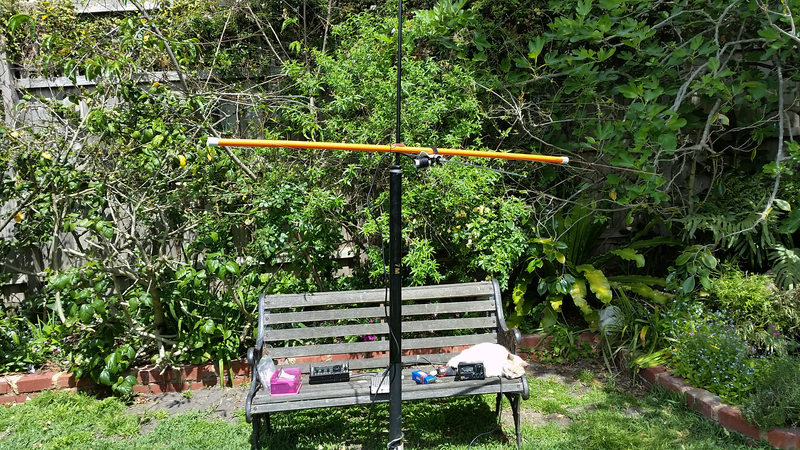 The results have been a very compact and light weight yet reasonably robust antenna that does not encumber any additional effort to cart up to a summit. I use a fishing rod holder to transport my squid pole and the yagi boom with the parasitic elements inside it, fits neatly inside with the squid pole. 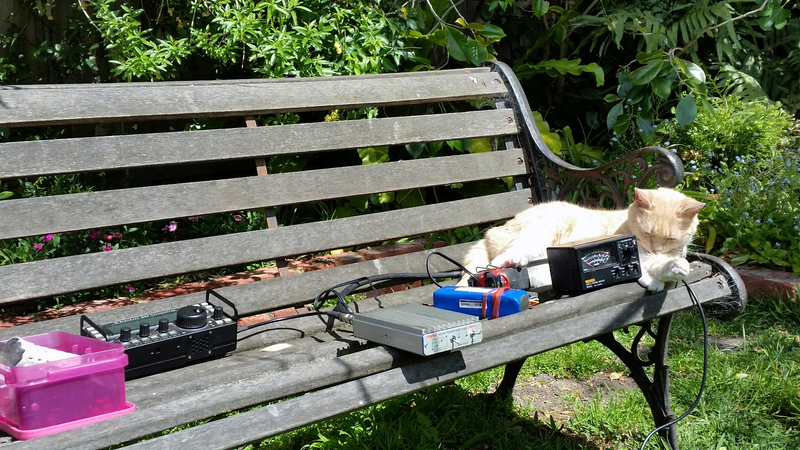 On 2 metres, I use the internal batteries of the KX3 with RF power set to 1 watt. The Digitor amplifier is powered from the 4200 mAh LiFe battery and produces 35 watts output with 1 watt input. The power connection on the battery, KX3 and amplifier are all uniform. PL259 to BNC male adapters are used on the back of the amplifier as well as female to female BNC adapter. A short SMA to BNC fly lead connects the KX3 to the amplifier. There is also a short BNC fitted coaxial lead to connect the antenna to the amplifier. 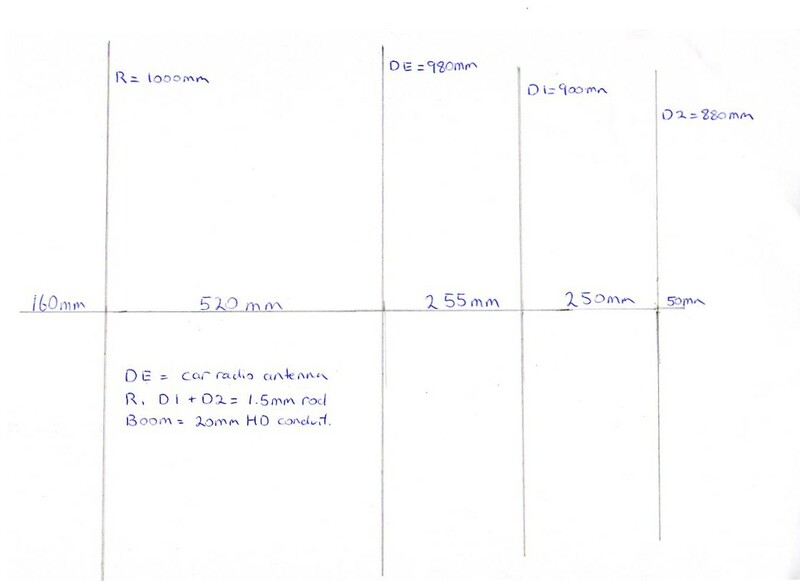 R to DE is 520mm, DE to D1 255mm, D1 to D2 250mm. Tolerance to the nearest mm not required. DE, when compact, is 500mm long. R, D1 & D2 fit inside the boom for transportation. Balun has been given an AFW stress test with 3 minutes of 30 watts FM without producing any smoke, or for that latter any discernable heat. Next will be to use the Mk3 in the field!